Babbling is quite an interesting thing. Did you know that babies, no matter their hearing status, babble? In the first few months of life, infants develop the same way in this regard, but at about 6 months, hearing infants begin to produce consonants and vowels fairly rapidly, while the deaf infant will stop babbling. It would seem this is the case because hearing children have a full auditory feedback loop, whereas deaf infants do not. However, if that deaf child is born into a signing deaf family, we may see a rather unique happening, babbling, via manual signs. These manual babbles are more than gestures, and are truly isolated handshapes or movements. 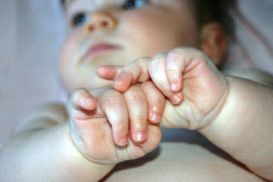 Deaf infants, unsurprisingly, use symbolic gestures more to communicate than hearing infants, likely due to the utility of manual babbling, but having the inability to have a full language at that stage of their life and language acquisition. For more information, check out “Language Learning in Children Who are Deaf and Hard of Hearing”by Susan R. Easterbrooks and Sharon Baker.